Ricky Ricardo: The 'Mr. Babalu' Next Door In the 1950s, the man who loved Lucy helped introduce mainstream America to a slice of Latin culture. He was based on Desi Arnaz — yet Arnaz was hardly just playing himself. Felix Contreras has a musical portrait of the fictional Cuban-American bandleader. 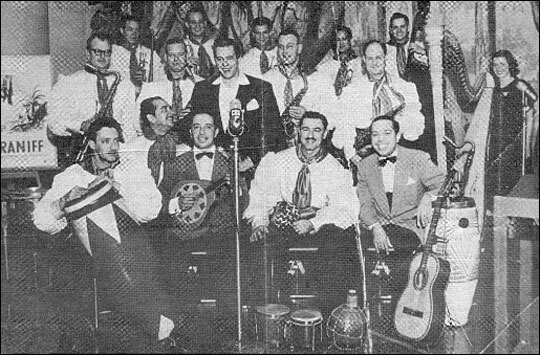 The Desi Arnaz Orchestra; trumpeter Tony Terran is in the top row, third from left. 'Splainin' to do: In 1951, sensible, hardworking Ricky Ricardo — forever sorting out the tangles his wife Lucy got the twosome into — went down easy with a Middle America that didn't know too many Latinos. When I Love Lucy appeared in 1951, mainstream America knew very little about Latino culture. Ricky Ricardo changed all that: His heavily accented English — and his rapid-fire Spanish — were as new to some parts of the country as TV itself. And then there was the music. Ricky Ricardo may have been a fictional character, but he played very real music. I've been playing congas for 35 years, and I can't tell you the number of times people have come up to my drums, unable to resist trying out a drumroll and crooning the opening phrase of Ricky's signature "Babalu." Of course like everything else about him, Ricky Ricardo's version of "Babalu" was a mix of fact and fiction. Ricky Ricardo was based on the very real Cuban bandleader and vocalist who played him: Desiderio Arnaz y de Acha, or Desi Arnaz. Ricky was from Havana; Desi was from Santiago de Cuba. Ricky emigrated to New York, Desi to Miami. 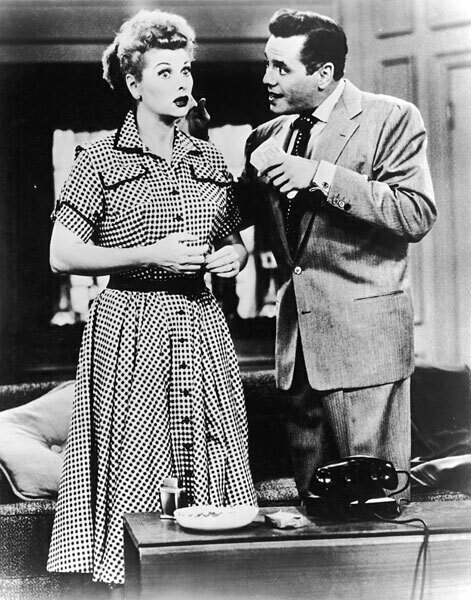 Ricky married Lucy McGillicuddy; Desi married Lucille Ball. Ricky's wife wanted desperately to be in show business; Desi's wife was already a successful radio and film actress. Ricky eventually owned a nightclub; Desi eventually owned TV and movie studios. So it only took a few changes for I Love Lucy's writers to turn Desi into Ricky. Says 81-year-old trumpeter Tony Terran: "They retained much of his character and his emotional side." Terran is the last surviving member of the Ricky Ricardo Orchestra, the band that backed Ricky in that I Love Lucy nightclub. Terran says that, while Ricky may have been fictional, his band was very real. The Ricky Ricardo Orchestra was made up mostly of the Desi Arnaz Orchestra, which had been playing in ballrooms and theaters around the country when not performing on Bob Hope's radio show. Yet many in Hollywood had their doubts about a TV show based on all-American girl married to a Latino. The band's musicians felt differently. "I think the general feeling in the band was that it was quite a venture," Terran says. "It made some sense to us — we didn't have the same doubts that CBS had." After all, Terran says, many popular orchestras back then were designed for mass appeal, alternating between swing and Latin rhythms, with vocalists singing in both English and Spanish. 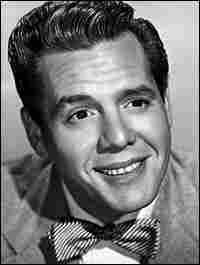 Desi Arnaz got his start in the late 1930s, with a band led by an early Latin crossover success, Xavier Cugat. Arnaz wrote in his autobiography that he patterned his own band after Cugat's. Terran agrees, saying the Ricky Ricardo Orchestra played the same kind of music. "We were commercial," Terran says. "We were more for TV." "It was corny but commercial," says Johnny Rodriguez Jr. "I mean, it wasn't the hip Latin music." Rodriguez, a percussionist, remembers both kinds of orchestras. His father played in both Latin bands and so called "society bands" in New York in the late 1940s. The younger Rodriguez got his start at age 17, with Tito Puente in 1962. He says he heard from his dad, and from older musicians in Puente's band, that there were plenty of rewards for orchestras like Ricky Ricardo's. "They weren't [playing] the standard Latin gigs," Rodriguez stresses. "It was upper end, the better-paying jobs. This is Broadway, this is the Paramount Theatre, Roxy Theatre — this is not the Palladium, not a Latin club. I'm talking about playing to Americanos." 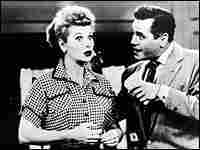 Millions of Americanos tuned into I Love Lucy, and most of them probably didn't realize that Ricky Ricardo's signature song was a tribute to an Afro-Cuban god. "Babalu," written by Cuban composer Margarita Lecuona, is about Babalu-Aye, one of the seven main gods of the Afro-Cuban religion Santeria. It was first recorded by Cuban vocalist Miguelito Valdes in 1941 — and among fans of more traditional Latin music, Valdes was the real Mr. Babalu. Latin music fans will also say Ricky Ricardo was probably not the most authentic Afro-Cuban percussionist but John Rodriguez says that was OK.
"I remember my dad saying that he was a terrible conga player," John Rodriguez says. "You'd see him playing on TV, and ... the way they staged it, it looked good. And that's all that mattered." It mattered because TV, and Ricky Ricardo, helped spread the word about Latin music across the country. TV had this show, and had this Latin music, on a regular basis every week," says Fordham University sociology professor Clara Rodriguez. "They were the No. 1 show for 6 years." She points out that folks in the U.S. got their first taste of Latin music from films of the 1940s, featuring Carmen Miranda and Desi Arnaz' old boss, Xavier Cugat. But while those film stars were exotic, TV's Ricky Ricardo had much more in common with Middle America. "He played a Latino who had a steady job; they lived a middle-class way of life," Rodriguez says. "He was the man ... who was the bread winner in the family. ... So he introduced a character which wouldn't have been very different if he had not been ethnic." Ricky Ricardo was easy for non-Latins to accept. But I've often wondered whether or not this Latino Everyman would have been as successful a band leader as his real-life counterpart, Desi Arnaz, was in the television business. Tony Terran, who worked with both men, the real one and the fictional one, says yes. "If," Terran says, "Lucy wouldn't get him in trouble all the time."